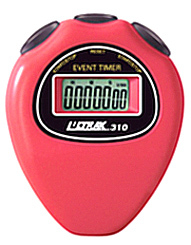 The new Ultrak 310 is a simple event timer that is ideal for students, volunteers and other occasional timers! All other entry-level stopwatches (pick a brand) include a mode that takes users out of the stopwatch function and into time, date, alarm, etc. This has the potential for throwing those who seldom use a stopwatch for a loop, particularly event volunteers. The 310 was built specifically for infrequent timers like volunteers and students. Available in black and six vibrant colors!